Hockey season is upon us, meaning plenty of action on the rink to come. But there are also lots of opportunities for grabbing spectators’ attention via advertising, in particular rink boards. The basics, however, are the same: the material must be easy to apply and should adhere securely to the surface while on display but be easily removed with no residue when the campaign is over. Usually, they are about 28″ to 30″ high, so often rolls with widths of 60″ or 62″ are required so they can be doubled up. It is not just the NHL that is using rink board advertising, many community and local rinks are using rink board advertising to build revenue. Tournaments and charity games often have sponsors who need in game recognition. These tend to be longer-term projects lasting days, weeks or even entire seasons. This sort of application would often be a removable vinyl that is laminated for extended longevity and abrasion resistance. Drytac offers several vinyl and laminates that are an ideal and affordable solution. Drytac has produced several products for rink board advertising applications. In North America, Drytac’s Polar Transit is a product that can do double duty. Originally designed for bus advertising, many NHL rink board advertising campaigns use this product. As the name suggests, Polar Transit has great adhesion on smooth, flat surfaces such the sides of vehicles, but is also ideal for sports arenas – thanks to its rugged qualities, it’s used for advertising and signage that can last for up to three years. This matte white polymeric self-adhesive PVC film aids vibrant color printing with UV, latex, solvent and eco-solvent technologies and its removable gray acrylic adhesive makes it easy to apply and to take down when the game or season is over. 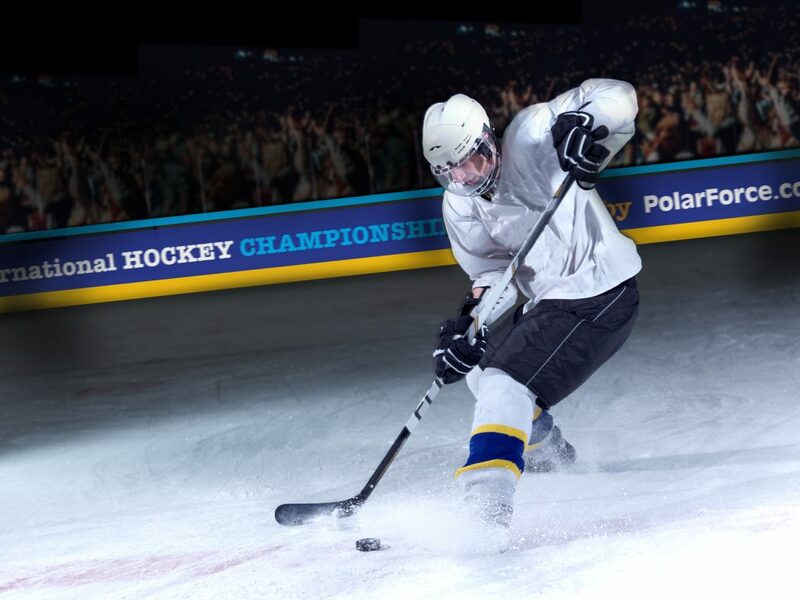 In Europe, Drytac’s Polar Premium R 80 can be used for flat or slightly curved surfaces, making it ideal for sports arenas in addition to vehicle livery. This polymeric self-adhesive PVC film has a high opacity and consistent white point that provides an excellent printing surface with UV, latex, solvent and eco-solvent technologies. Its removable grey solvent adhesive makes it easy to apply and to take down when needed. It also has up to a seven-year durability when paired with a matched overlaminate. Take a look around Drytac’s other Polar products designed for windows, floors, walls, POP displays and more, helping you create ice-cool graphics.